It was the Belgian poet and playwright Émile Cammaerts who lent the words to the English composer Edward Elgar (Broadheat, Worcester, 1857 - Worcester 1934) for his Op. 75, known also with the title of Carillon. 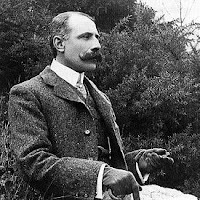 The contact and bridge between Elgar and Cammaerts was possible thanks to the Cammaerts' poem that Elgar found and red on the "The Observer". This recitation for voice and orchestra belongs to a rich chapter of Elgar's works. In the opus of this long-lived composer we can nimbly outline a group of compositions dealing with our theme of First World War in music: from The Fringes of the Fleet, taken from the booklet by Rudyard Kipling, to the Cello Concert (Op. 85) composed in the aftermath, we may have more than one opportunity to meet again this musician. As told we will stay today with the Op. 75 and we will probably come back with other suggestions in the next weeks. In the meanwhile, before or after listening to the excert, you can go into details about Carillon at this Wikipedia link: there is nothing that we could add to this brief and incisive introduction to this piece of music.